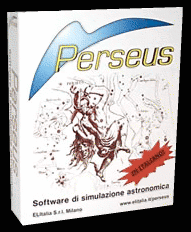 Perseus is an astronomical simulation program for Windows. It's able to recreate the sky view as you would see it being in any time period and in any place, in Earth or Space. Perseus can represent a truly realistic sky, allowing real-time animations. It's based on the most recent star databases, in order to give you access to an enormous amount of data, all easily manageable with a few clicks of your mouse. Perseus has been realized paying attention to every single detail. We do believe that any other similar program is no match for Perseus, especially regarding the graphics; Perseus is able to reproduce with extreme realism the astronomical phenomena, from nebulae to Saturn's rings. Computation accuracy and precision is truly remarkable: on this subject, usually Perseus has proved itself equal or better to other similar programs. Perseus has been packed with many accessories, whose purpose is to transform your PC in an excellent support for your observations. It's able to substitute any paper catalogue or atlas, to help you foresee the sky conditions (clouds apart...) to help the planning and optimization of your observation sessions. Perseus is available in four levels. Is dedicated to beginners and to people with a general interest in astronomy. It offers a realistic and accurate simulation at a low price. Is already a complete astronomical software, with more than 15 million objects in its database, telescope control and free upgrades. Adds the opportunity of using the USNO-A catalogue, version 1 or 2, or the UCAC-2 catalogue. Level III adds a dedicated Script function which allows the creation of lessons and lectures, making Perseus an exceptional learning instrument.